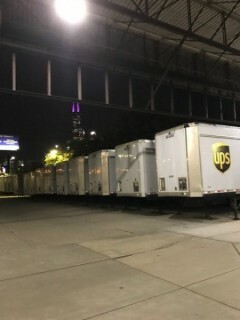 Chicago Teamsters to resume negotiations with UPS | Fight Back! Chicago, IL - Negotiations are set to resume Monday, November 12, between Teamsters Local 705 and UPS over a tentative five-year contract for over 10,000 UPS workers in the Chicago area. One of the last contracts to settle, Local 705 Teamsters are pushing back against concessions passed under the national master contract by Hoffa and Small Package Division negotiator Dennis Taylor that affect over 240,000 Teamsters. Local 705 remains one of the last independent Teamster/UPS contracts in the country. Local 705 gave UPS a 30-day notice on October 31 to end a contract extension, raising the possibility of a strike. Preparations have been underway to for members to conduct a strike vote. Earlier today, November 11, a vote count revealed that Teamsters Local 705 UPS Freight drivers voted down a second contract proposal, 125 to 34, showing their willingness to strike in the face of massive threats by the employer. UPS Freight, a division of UPS that handles "less-than-truckload" shipments (typically medium-sized shipments of objects over 150lbs), employs approximately 12,000 nationwide, hundreds of whom work in the Chicago area.